The snow has melted in southern Ontario the last couple of days thanks to the great deal of rain we’ve received. 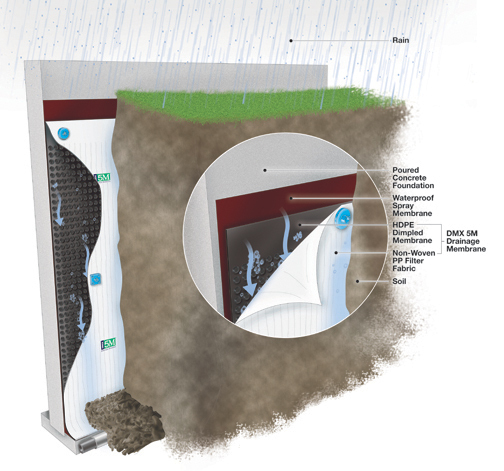 Do you sometimes wonder how a contractor is able to protect your house’s foundation from water? Or what happens when there’s a leak in your basement – why there was no protection? Maybe you’re missing DMX 5M Drainage Membrane. I recently had the pleasure of working with DMX Plastics, a company that specializes in ground water control products. 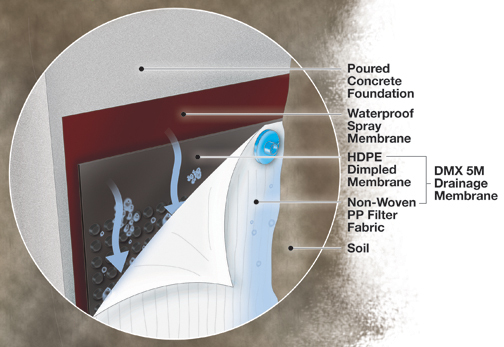 The featured product that I illustrated was a drainage membrane that is placed against a concrete foundation and allows for proper flow away from the foundation. The challenge with this technical illustration was creating a visual that gave an overview that set the scene for the product, as well as showcasing the features of the product. We achieved this through a zoom-in section on the illustration that showed details of the various layers. It was a pleasure working with Steve and Paula on this illustration!